You are at:Home»Common»ESP8266 Weather Display: Featured on Lifehacker and by Adafruit! 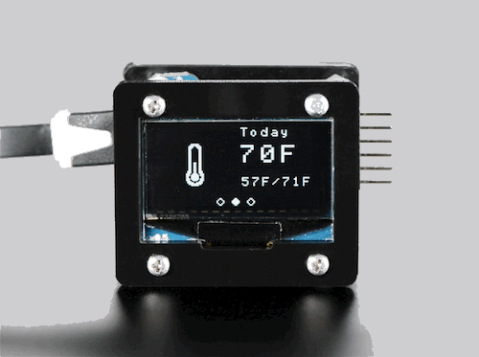 ESP8266 Weather Display: Featured on Lifehacker and by Adafruit! And I thought that looks exactly like my weather station code for the ESP8266! Following the link to Adafruit reveals that they built a kit based on my code. They also didn’t forget a reference to the github project which contains the weather station code. Thanks Adafruit! Fun fact is that the code went full circle: I tried for a long time to make Adafruit’s GFX library for the OLED display work with the ESP8266 but just didn’t succeed. Then I decided to write a library myself and now they are using my code in one of their projects. That’s the beauty of open source software! I think there is a little typo in your php code, the last tag is SUMMARY_TOMORROW instead of SUMMARY_TODAY as it is not used neither you nor Adafruit did see it. Great job you did, the icons and the little "spinner" really look good. Привет Даниель! С Новым годом тебя! Я из России, и мне нравится твой проект погодной станции! Но есть проблемы: Не все библиотеки на Github работают правильно! Многих библиотек не хватает, или они имеют ошибки… Могли бы Вы собрать и опубликовать все рабочие библиотеки в одном месте? И ещё одна проблема: Вы используете OLED display – SSD1306, А у меня – SH1106! Можно добавить поддержку этого дисплея в Вашу библиотеку? Google translation of your text: Hi Daniel ! Happy New year to you! I am from Russia and I like your project weather station ! But there are problems : Not all libraries on Github working correctly ! Many libraries do not have enough , or they have an error … Could you collect and publish all the workers of the library in one place? And another problem : You are using OLED display – SSD1306, And I – SH1106! You can add support for the display in your library ? I realize that the separation of the library might cause you trouble and I'm sorry for that. As long as you always use the last version of the three required libraries this should not happen. I chose this way because the libraries can also be used for other purposes than only for the WeatherStation. About SH1106: I'm not planning to adapt the library for SH1106 since I currently don't own one.